The poolside scene. All photos courtesy of Viceroy Santa Monica. Santa Monica is a city of two faces. On one hand, there are the tourists, heaps of them, all clutching cameras on their way to experience the panorama of the seaside, its fabled pier, and its photogenic ferris wheel. On the other, there are the nice bars, restaurants, and boutiques, as well as the pacifying, salty breeze of the Pacific, all of which exerts an irresistible pull on the tourist throngs, local families, and tech millionaires of Silicon Beach (named so because of the abundance of startups). 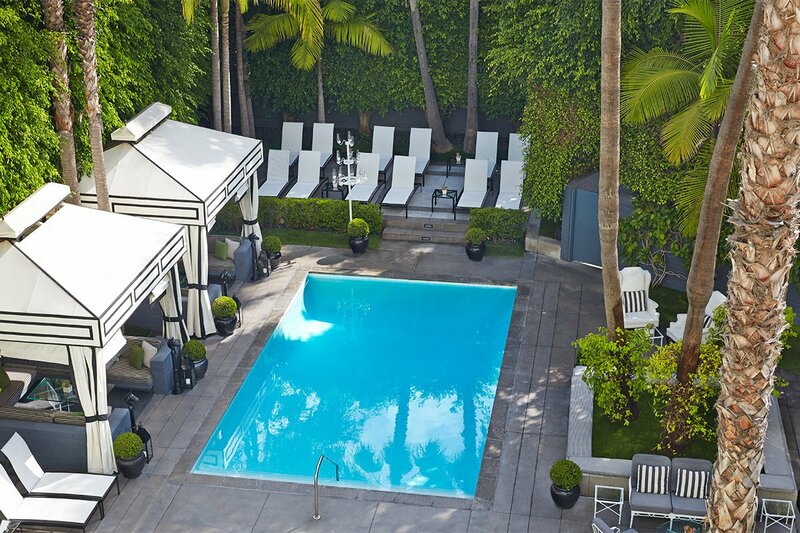 Travelers who want to indulge in all the city has to offer without drowning in the mob need only check into Viceroy Santa Monica, where a wonderland of quirky interiors, a fashionable poolside dining scene, and a central location a block from the beach offer the best of both worlds. The lounge at Cast Restaurant. One of two heated outdoor plunge pools. 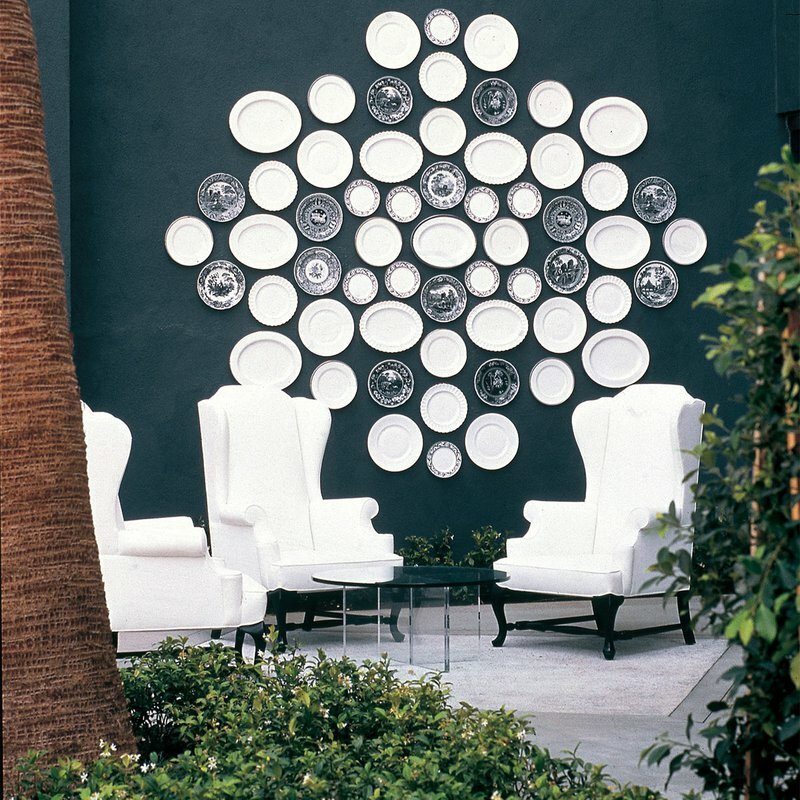 Style: Eclectic British country home meets breezy, beachy Los Angeles crash pad. 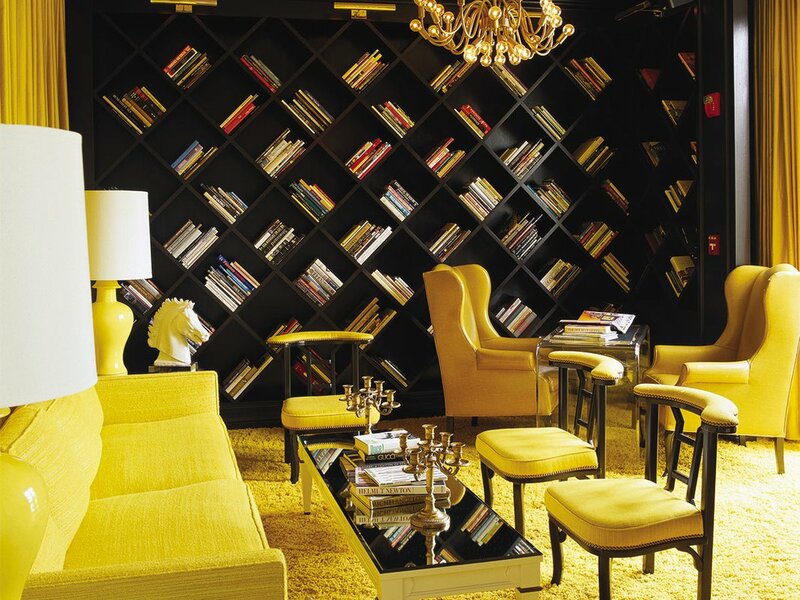 A criss-crossed library statement wall, a mismatch of vintage and modern furniture, a fun smattering of mirrors, and bursts of groovy green and yellow against a black and white color scheme in the lobby make a lasting first impression. Standout Detail: Well-appointed, oversized rooms with views over the ocean make the most of a prime location. This Place Is Perfect For: Discerning sightseers, families, and anyone who wants to be in the heart of Santa Monica. 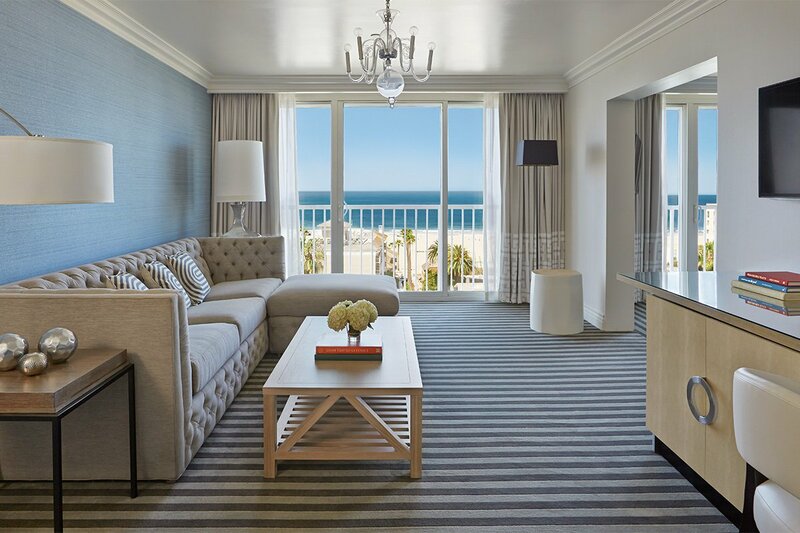 Rooms: 162 spacious guest rooms, including five suites and connecting room options, offer more than enough room for families and couples to stretch out and relax (and do yoga even) while reveling in views of picturesque Santa Monica. 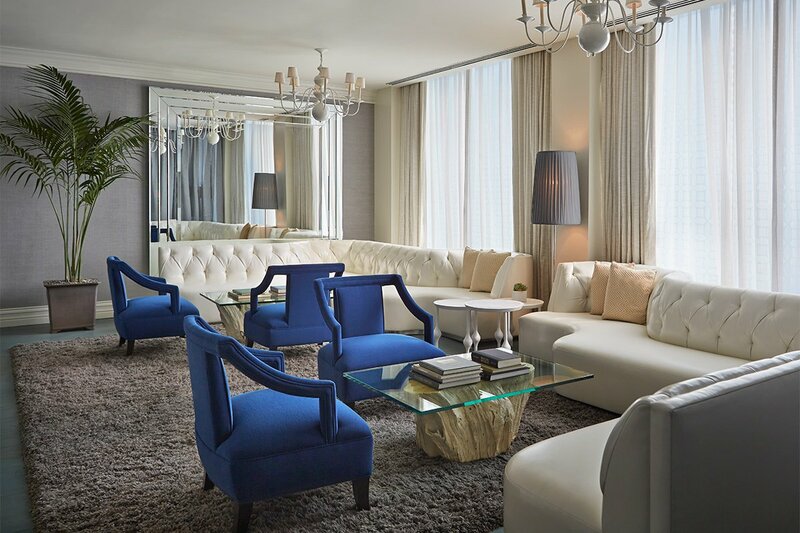 A blue and white color palette, along with contemporary furnishings, stripped carpeting, custom armoires, and marbled bathrooms stocked with Natura Bissé and Roil bath products, complete the beachy look and feel. On Site: Complimentary beach bike rentals, a library in the lobby, a 24-hour fitness center and business kiosk, room service around the clock, free WiFi, 10,000 square feet of event space, and two luxurious, outdoor heated plunge pools surrounded by 1920s-inspired, black-and-white draped cabanas stocked with lamps, TVs, privacy blinds, and h furniture. Food and Drink: Cast Restaurant and Bar, the hotel’s well-lit, seasonal, full-service eatery serves a variety of fresh, creative dishes with ingredients from Santa Monica’s farmers market — think egg white tortilla wraps and green juices for breakfast; baby beet, avocado, and grapefruit salad for lunch; and short rib, ham hock, veal, and bone marrow bolognese for dinner. 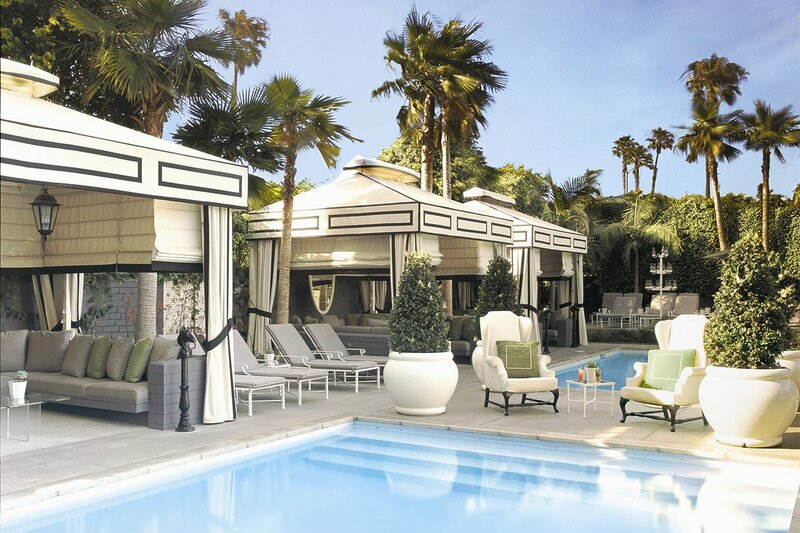 Food and drink service spills out from the dining room to a lounge by the lobby and the cabana-filled patio by the pool, which, when the twinkly lights come on in the evening, feels like a secret garden. Rates change dynamically and start around $300/night. , or get in touch with the and we’ll plan your trip for you. 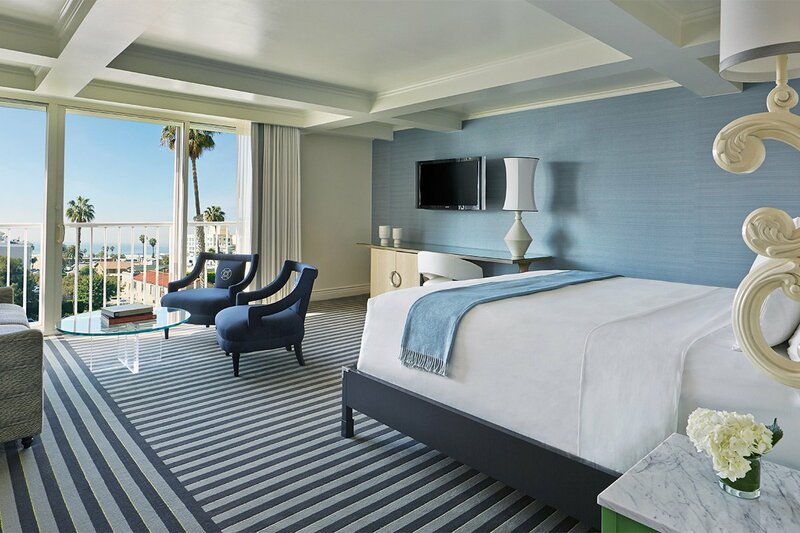 An ocean view king guest room. 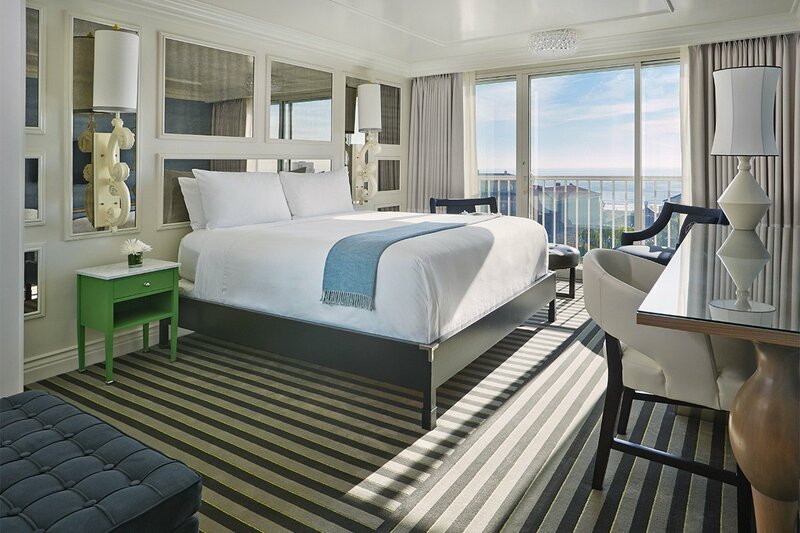 A grande ocean view guest room. Being so centrally located, at the corner of Ocean Avenue and Pico Boulevard, certainly has its perks. The trendy boutique and noteworthy restaurants of Abbot Kinney Boulevard in Venice are only a fifteen-minute bike ride away. (The hotel’s free bike rentals come in handy here.) But for those who want to stay hyper-local, there are plenty of nice places to spend a night out nearby. , from Santa Monica's Own Native Canyon Restaurant Group, is making waves for its decadent nachos and delicious margaritas, best enjoyed after catching the sunset across the street (read: Pacific Coast Highway) at the beach. Fresh-on-the-scene is the place to go for afternoon Italian-inspired small plates and glasses of natural wine in a light-filled space that conjures images of the Mediterranean. , also opened recently, is a newsworthy Santa Monica gem, where chef Nyesha J. Arrington's captivating, globally inspired meals nod at her multicultural background and Korean grandmother. On the more classic side of things, there's local favorite , an all-day cafe that does a mean breakfast with organic eggs; the beautifully designed , which is perfect for fresh bites, coffee, and drinks around the clock; and the iconic and for sunset cocktails on any of their panoramic dining spaces overlooking the Pacific. Also of note for families with young kids: , a super cool co-working space that keeps parents and their young ones occupied with hourly work passes, a boutique playground, and educational classes that parents can drop their kids off at while they hit the town.